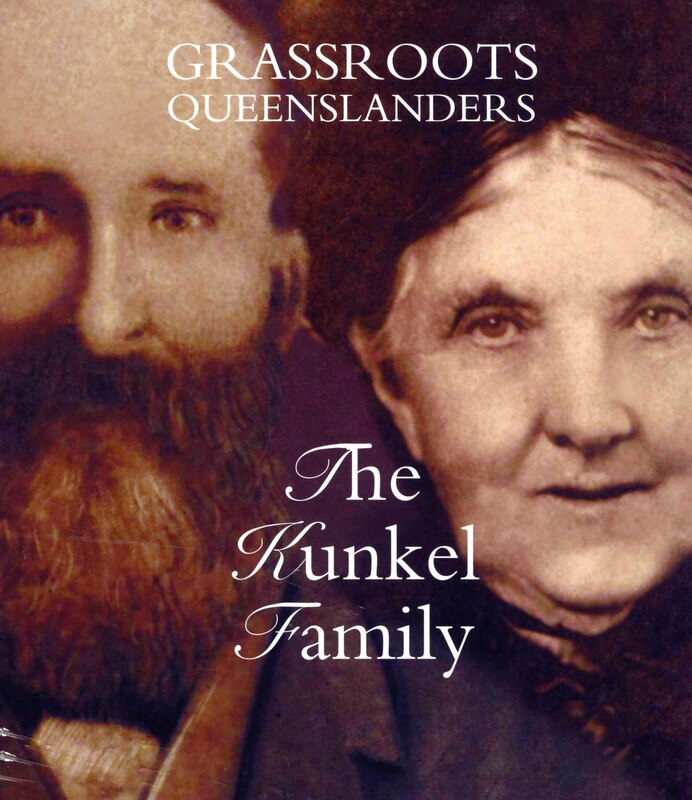 This entry was posted in Family History, Kunkel Family History, Sepia Saturday and tagged George Mathias Kunkel, Grassroots Queenslanders, Kunkel family history, Mary O'Brien Kunkel, Murphy's Creek, Sepia Saturday by cassmob. Bookmark the permalink. The front cover looks great. Yes she looks like a very strong lady with a sly sense of humour. She does dominate and I am drawn to her more than George. I understand the emotion, pride and satisfaction of first holding your book in your hands. I experienced it also when my book was first delivered. We have been able to preserve the memories, stories and facts surrounding our ancestors/family and our names will be recorded and remembered for generations to come. I could have used my front cover for Sepia Saturday this week too as the cover is a collage of family faces over 5 generations. Thanks for your comments Sharon. I agree that Mary looks easier to know than George but I have a soft spot for him just the same. Congratulations on your family history too….it’s such a thrill isn’t it, and a gift to posterity as well as a great sense of accomplishment. An excellent image to have as a book cover, and I envy you having got the book out – I have yet to overcome that hurdle. Thanks Brett….it all comes together eventually…keep the “faith”! Pauleen – you can see the resemblance between you and Mary! It’s a truly beautiful cover photo and congratulations on having your book to hold in your hands! Thanks Angela for your kind words. I used to think I got my slightly “odd” eyes from my paternal grandmother but this photo of Mary makes me wonder. A wonderful posting with such a powerful image for your book cover – and very different from anything I have seen of other published family histories. I can fully understand your pride and satisfaction on achieving publication. I have only had my own material spiral bound at a local printers, but it is amazing what a difference it makes to see my efforts in final form. Thanks Sue! I think having our family histories written up in whatever form is a great gift to our current families, and hopefullyl the future. Mary looks as if she is speaking to us and about to tell her story. Indeed she does -the designer did a great job to make George and Mary’s strength show through the design. I love that Mary’s is the dominant face in this image – implies strength. It’a a fab cover – you must be so proud of your work. Thanks Jill, yes it was a huge thrill to hold the book. I agree Mary’s character shines from this image. Congratulations on the book. The cover looks magnificent, and I am sure the contents do it justice. I also like the way the picture highlights Mary’s face.The important role of women in days’ gone by is too often overlooked. Well Done Pauline. You were the only one who matched all the faces. You are very observant. I was excited just looking at your book cover! Very nice job! I liked how different their eyes were — his straight on and strong; hers, more connecting, questioning. Or perhaps I am just imagining — and telling myself stories as I am wont to do. Thanks Joan. You’re right about the eyes, I hadn’t thought of it that way before. Their faces speah to you from the cover, The eyes have I’m sure. The sepia image is wonderful. Well done. I am enjoying the family pieces that are writing. They make me smile wistfully. And because of your creativity, I have nominated you for the Sunshine Award–a creativity award.